The first thing people say to me when I tell them I’ve begun drinking Single-Malt Scotch is “Isn’t that stuff expensive?” On the surface of it, they’re right. A few $70 bottles of Lagavulin 16 year, an $80 bottle of Aberlour A’Bunadh, several bottles of $35 Laphroaig… it adds up. But wait! I decided to do some math. How expensive is drinking good Scotch, compared to other similar pastimes? A little research quickly revealed that there is no standard unit of volume for whisky. To a Scotsman, a ‘wee dram’ is less a matter of careful calculation, and more a matter of tipping however much you like into your glass. 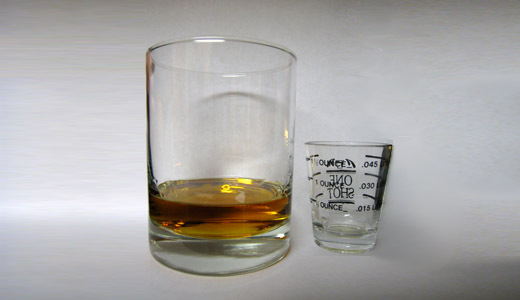 Luckily, after a little personal experimentation and the information at this helpful site about Units of Measure, I settled on approximately 2 fluid ounces as a typical “glass” of whisky. Note that the dram or drachm is equal to 1/8 of a fluid ounce, or about a teaspoon. No Scotsman is likely to be satisfied with such a measure. …then there are approximately 12.68 “glasses” of Scotch in a bottle. If a bottle costs $70, that means you’re paying $5.52 per glass of Scotch. If a bottle costs $50, that means you’re paying $3.94 per glass of Scotch. If a bottle costs $30, that means you’re paying $2.36 per glass of Scotch. Compare this to wine: a quality $15 bottle of wine has approximately four glasses in it. Each glass is $3.75. Compare to cocktails: A $27 (750ml) bottle of Grey Goose vodka gives you approximately 10.7 dry martinis, at a cost of $2.52 per cocktail. Compare to beer: An $8 six-pack of craft brew costs approximately $1.33 per bottle. Clearly, drinking even a $50 Scotch is equivalent to drinking middle-range wine, and only slightly more expensive than drinking top-shelf martinis. Still think the “Good Stuff” (>$70) is too pricey? Update: As you can see in the comments section, I’m comparing apples to oranges: scotch purchased at a bar is of course more expensive than scotch consumed at home. The commenters are correct. However, note that my point here is: drink expensive scotch at home and you’re better off (financially) than drinking overpriced drinks out. I also maintain that because you get more drinks out of a bottle of scotch, and can consume it over the course of a year or more, it can be cheaper than popping open a $15 bottle of wine all the time. Finally, c’mon people. This is a blog, not a medical journal – cut me some slack. Great stuff! I just discovered your site due to twitter. I have added you to my blogroll. BTW, in my opinion, I think a 2-oz. serving would be HUGE. I get by with 7/8-oz. (or 1-oz.). For me, I get 25-30 servings out of a bottle. It’s really not expensive on a per-serving basis, especially when I drink it the way I do. I must be part Scottish…they are stereotypically “tight” with money. Like all of my opinions, it’s just mine. I am glad you enjoy whisk(e)y however you do it! 7/8 oz. – Really? Okay, either you don’t really like Lagavulin or it really affects you. Maybe it’s because I go about 280 that I have 3-4 shots with an 1-1/2 hour cigar. Now that’s an enjoyable evening albeit only enjoyed a few times a year due to my lack of success. Great research. Finally, I have something to show my wife, who prefers wine, and complains about the cost of my Scotch love. Wonderful blog, very well done. Congratulations. Hey man, great stuff here. Basically I just started getting to know good whiskies. To me, it all really depends on how frequent I drink a fine scotch or a good beer (I live in Belgium so I have easy access to the world’s best beers and relatively cheap). I bought a JW black label (again, I just started learning) and the bottle is almost empty after a month and a few days. So how long can you go with a bottle of good scotch? I generally alternate between my more expensive and cheap bottles of whisky, to “stretch” the good ones out. Also, I tend to end up with 8 or 9 open bottles at a time, so as long as I finish any individual bottle within 6 months of opening it (I finish them off faster when they get low, to avoid oxidation), then I figure I’m getting maximum enjoyment out of each. I think one can get tired of the same dram night after night, even of top-quality stuff. I just found your blog and really have enjoyed reading it. For a newbie you sure have a great grasp on the subject. I love good scotch. But you are comparing apples and oranges when you compare drinking scotch at home vs the cost of drinks outside. 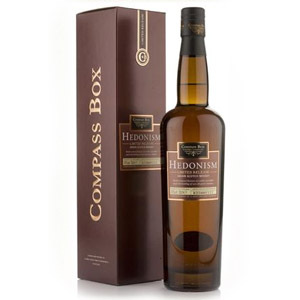 The bottom line is that a bottle of good scotch is more expensive than other liquors. But you do get what you pay for. Cheers. I have to agree with Don. You cannot compare drinking Scotch at home to having drinks out at bars. If that comparison would be accurate, you would need to use the cost of a pour of Scotch at a bar, which, I almost guarantee, would would cost more than $5.52 a glass. Additionally, your comparisons in the first segment don’t say much considering most single malts are more than $50. If anything, you are showing that drinking single malts will most likely cost you a third to double that of a comparative drink. I do enjoy my Scotch, but by no means is it inexpensive. steve I buy scoresby scotch 22.00 1.75 liters,it’s good . I might drink a few glasses of Scotch 4x a week. I generally go through about 2 bottles a month of the good stuff. If you’re aim is to get drunk, Bush beer is always the best choice for that purpose. Because drunks aren’t much of beer or spirit aficionados to begin with. And if they were, they’d enjoy the drink for what it is and savor it. IMHO, It’s actually cheaper to have a few drams at home and sip and enjoy the quality. Why? Because you can look high above at all of the people who’re drunk suffering from catastrophic hangovers in laughter. Why? Because you can, and it always feels good to look and judge other peoples downfalls when you’re doing quite well in life. It’s human nature!! I’m just getting into Scotch drinking. Are most people in agreement that 2 fl.oz is a typical amount in a glass of scotch? Hi Rohit. I’ve never heard of any kind of general agreement in pour size, but I personally pour about 1.5 oz (to the widest point in a Glencairn glass). This isn’t a limit imposed by anything other than habit, though, and I’ve also been known to pour just a little bit (1/2 oz) into a glass, several different times from several different bottles. 🙂 When I make a cocktail like an Old Fashioned, I use 2.5 oz. I just wanted to say thank you for writing this. It was a great way for me to relieve my financial guilt lol. I literally started drinking scotch about a weekish ago. Already bought 2 bottles (no they aren’t empty yet lol). The one I got today was Laphroaig 10. So delicious! Keep writing. If you’re prone to drinking anything of quality- be it beer, wine, bourbon, scotch, anything- you’re going to spend about the same amount of money. I reached a point a few years ago where it just wasn’t worth buying the cheap stuff. If I can’t afford what I want, I get nothing. High quality beers are running in the $12+ range for 4 or 6 packs in my neck of the woods, with many of the really desirable beers coming in around $15 for a 4 pack. This leaves me with paying $4/drink for beers at home, on average, or about $4/drink on scotch at home, or $4/drink on wine at home, based on my tastes. Drinking to get drunk is a loser’s game, and is best done with bottom shelf paint thinner. I’ll stick to a glass a day of something worth drinking. Hear, hear! Thanks for the comment Austin. 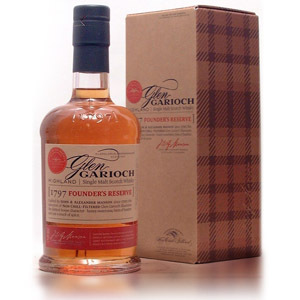 I currently have bottles of Laphroaig Quarter Cask, Highland 12, MacAllen 10 that I break out for special occasions. Each is dramatically different and on such occasions I most frequently enjoy small pours (~25mL) from each bottle. I bought the MacAllen back in August and still have quite a few good pours left. Everything else is pretty much bourbon or rye, which are drank straight or used for mixing. Most of my domestic bottles are $20-$30 but I will still gladly pay $60+ for a good bottle of scotch. Yes! This is what I’ve been trying to tell my friends for years. Scotch-lovers unite. Is there some kind of LAW against repackaging whiskeys into sampler 3cl or 5cl bottles for re-sale? What gives? 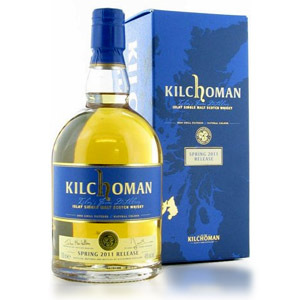 I simply can NOT find sampler bottles of the fine single malt whiskys outside of the UK (I am in New York BTW) Even such a big city as NY = no dice on samples. UK online companies are doing blowout volume pricing on their shipping: 1 kilo minimum! WTF. There is in the US, yes. I don’t know the legal specifics, but it’s definitely not possible unless you’re a licensed bottler, and then you’d probably need to have an individual license granted for each product that you’re bottling if you didn’t distill it. It is, however, legal in certain European countries, which is why we can buy samples from Flaviar or Master of Malt, etc. I suggest buying a large number (like… 30) of samples from Master of Malt to spread out the (very high) shipping cost. Note, though, that it’s possible for US Customs to seize it… never happened to me, but I’ve heard of it happening. On the other hand, you can request Master of Malt to drop the VAT tax (which is hefty), if shipping to the US, which saves some cash. alas…..big fish woulda been ALL over this smaller size market if it were allowed from the start! Good on UK. Right on Santos! I’m currently on my third dram of the night, feeling pretty good, and wondering why the hell I don’t have the self control of some of these other commenters. Good to know there are others that like to pound the good stuff, budget be damned! The National Institute of Health states that the average pour for distilled spirits is 1.5 oz. It is based on alcohol per volume and can vary within each category (i.e. beer, wine, spirits). It is a good “rule of thumb” to keep in mind if you are at a bar to ensure you are getting what you pay for, however, when drinking at home, the pour size is obviously more dependent on preference than a standard. I figure I drink less than 2 oz a night — closer to 1.5 oz. I believe you err to the conservative on the wine comparison. Setting aside pricing — most folks I know drink $30 wine regularly and splurge for more expensive ones — you have to drink the entire bottle that night or it is mostly wasted. While I can sit down when I get home from work and enjoy a single dram a night (my routine), if I did that with wine, I’d be wasting about 4/5ths of the bottle (call it 1/2 if my wife joins me).